Your house is important to you and it should be maintained at all times. This is particularly crucial for durability and the overall sustainability of your home. Even if you used high-quality materials to build your roof, it will be eventually become progressively worse without regular maintenance and repairs. Undertaking cleaning activities is a vital part of the maintenance. 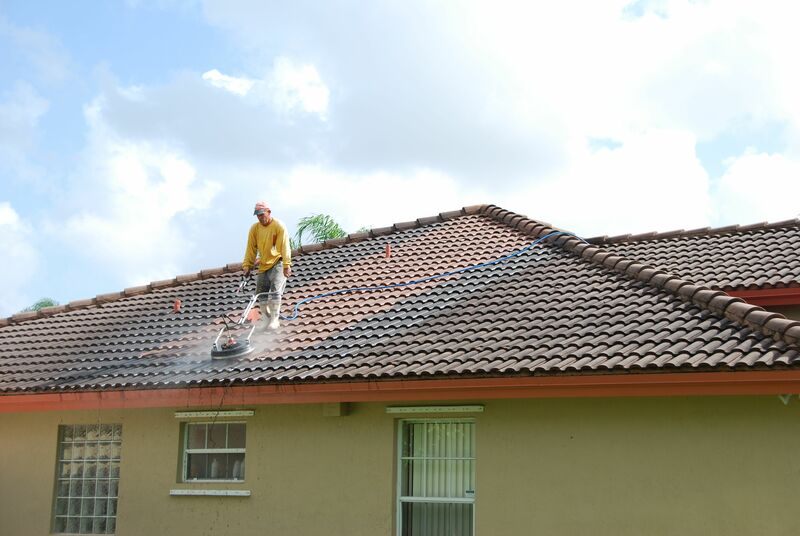 Many commercial property managers and homeowners in the Miami-Dade County area do not rank roof cleaning as a top priority compared to other regularly scheduled improvements. However, roof pressure cleaning is one of the most imperative aspects when maintaining a clean home or business. Roof pressure washing is more important than what is believed. Without a proper roof, you will not be protected from external elements, consisting of mold, pests, and insects. In the majority of cases, when homeowners witness black or brown streaks starting to become visible on their roofs, they fail to notice that this “dirt” is essentially a living, growing organism. It is usually known as mildew, mold, fungus, or algae. The moist weather conditions in Miami, create an ideal breeding environment for these microbes to develop over time. If these substances are not cleaned quickly, it can cause widespread damage to your roof. We recommend homeowners in Miami to have their roofs cleaned at least twice every year to avoid mold and algae growth. However, you should hire an expert roof cleaning company as it is a delicate process and requires proficiency. Your roof is one of the most costly parts of your home’s exterior. Removing any signs of algae, moss and lichen will ascertain its intended life expectancy. Algae and other forms of accumulation often form on the roofs of Miami homes can reduce a roof’s life expectancy. The existence of dirt, soot, or biomass can impact the absorption of sunlight by a roof. Consequently, this will represent the amount of heat a building absorbs. A roof wash is an effective method of eliminating mold, moss, mildew, and algae off your roof. Also, it can clean some of the rust from metal roofs. Here at R & R Commercial Surface Cleaning we us numerous home roof cleaning methods that vary in intensity and technique. For different applications, we may use bleach or sodium percarbonate solution. Our Local pressure washing services experts have designed a method to reach challenging areas such as higher or a steep roof. A concentrated mixture is applied to the roof and allowed to be absorbed. After cleaning, we then wait for the roof to dry. The machines we use to clean all home in Dade County utilize over 400-600 psi water pressures through a water broom. This guarantees the shingles a thorough rinse and protects it from any further future damage. It is NOT a high-pressure machine and is specifically used for roofs only. There are different types of roofs including Metal roof, Asphalt Shingle roof, Tile roof, and Concrete roof in Miami. Furthermore, all of our experts are able to identify the difference between various roof materials and use appropriate pressure to clean the roof completely. Additionally, an average garden water pipe has a pressure of approximately 50-75 psi which is not enough to make unattractive roofs stunning. We always recommend hiring a professional with experience when you plan on cleaning your roof because carrying out this kind of job yourself is potentially dangerous. Each one of these roofs has to be treated differently, which is why we always recommend a professional. Moreover, there is a high risk of a slip and fall. Most Power washing companies know the precise precautions which can avoid any accidents. Cleaning your home’s exterior especially the roof is extremely important. Roofs are normally discolored and tainted by common bacteria called geocapsa magma. Accumulation of these bacteria over time tends to damage a house’s value and aesthetics. When you choose to avail professional roof cleaning company services, we will decide on which method works best for your home; soft washing or pressure washing. Pressure Washing uses highly pressurized water to remove any grime or dirt from the roof forcefully. It is also known as “mechanical roof cleaning.” It utilizes a pressure washer or a brush to clean the roof. A pressure cleaning machine is set with a high-pressure water pipe and nozzle that lead to a diverse spray pattern or alter the extent of water that will flow out ranging from 45 degree- 0 degree. The majority of the traditional exterior roof cleaning companies utilize high water pressure to eliminate biological contaminants and surface growths. Although it is an effective solution, roof manufacturers mostly warn against high-pressure cleaning. This method expels water at 2,500 PSI (pounds per square inch) or more. Even though extreme water pressure is highly effective for eliminating stains, it will damage some softer surfaces of Miami home’s roofs. It can scratch shingles, remove paint from wood, tear down window screens, or disturb your siding. Moreover, the use of pressure washing roof tiles to clean asphalt shingles results in graduals. The shingles can be detached which takes years off of the roof’s lifespan. We always recommend a specific type of Professional pressure cleaning service for concrete or metal roofs known as power washing. 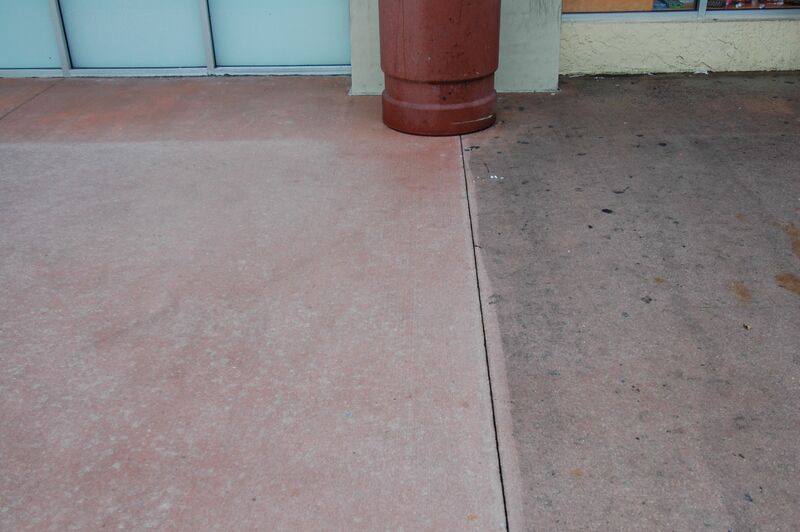 This method of cleaning is proposed for hard, external surfaces such as patios, sidewalks, decks, fences, and driveways. Given that a primary concern of pressure cleaning is damage to the roof; a better method is soft washing. Soft roof cleaning is also called chemical cleaning. As the name suggests, this method gives up much of the pressurization and suggests using chemicals. It is a system of spraying chemicals on the roof that is designed to take out unwanted substances on the roof such as algae, moss, and grime that builds up over time. These chemicals are both safe for the environment and for your property. A common type of soft wash roof cleaning makes use of a low concentration of chlorine bleach combined with preservatives like TSP, surfactants, and alcohol that are sprinkled on the roof of a building with a low-pressure pump. Where a pressure cleaner removes dirt with no chemicals due to the extreme pressure, soft washing systems need chemicals to get rid of the dirt before the water is sprayed on it. This system usually consists of a higher volume of water showered from the pipe and is a gentler house roof cleaning technique. Most of the roof cleaning services employ soft washing because its results are far superior for roofs. Certain surfaces are fragile as they can be easily damaged such as asphalt roofs, wooden and stained surfaces, etc. These areas can be safely cleaned by using a soft wash method without posing any harm. It utilizes economically friendly chemicals that aid in removing stains. Water used to soft wash your house will not have 1000+ psi, which is approximately half the amount used in pressure washing. Moreover, this method uses eco-friendly chemicals, automatically keeping the surfaces clean for a longer period of time. For this reason, soft washing services are recommended for roofs. Moreover, soft washing is a cost-effective technique because it does not require ladders or scaffolding. Some soft wash roof cleaning chemicals can damage your roof as well, which is why it is important that you hire an expert for any roof cleaning services. These companies are equipped with the right knowledge and can find the perfect balance of mixing these chemicals. Why Should You Regularly Clean Your Roof? When the paint on the exterior of your home is peeling or is filthy, it makes your entire house look dingy. No one wants to come home to a mess or hear constant complaints from the neighbors. Owing to this aspect, you must clean the exterior of your house including the roof. Neglecting your roof can not only ruin its aesthetic appeal but also lead to creeping damages. It could lead you to lose personal property from an invasion of mold and water damage. This is why hiring yearly roof cleaning contractors can go a long way to avoid long-term issues. Besides the aesthetic improvement, you can get many benefits from hiring power washing companies to clean your roof. There are many significant structural advantages of maintaining an algae free roof year round. Pressure washing roof tiles can improve its lifespan by removing debris, dirt, mildew, and fungus. Tree branches and limbs can get trapped on your roof, and may damage flashing and shingles. Your house lacks visual appeal when it has an unclean roof. It is important to be happy with your residence, whether you are living in it or selling it. Interestingly, in Florida, having a dirty roof can result in cancelation of your homeowner’s insurance policy. Any homeowner’s insurance policy provider has the right to revoke your insurance at any time. You will receive a mail stating the risk of losing your coverage due to a dirty roof that may have mold that can cause structural damage. In most cases, you will be given less than one week to hire metal roof cleaning services and get it inspected by an insurance agent. For this reason, it is best to avoid fees and risk losing your homeowner’s insurance policy. Residential pressure cleaning services are useful for improving the value of your house, saving time and extending its lifespan. If you plan to sell your house, then you must put roof cleaning on your “to-do” list. This will make a huge difference and leave a great first impression; ultimately affecting the sale positively. A house is a significant investment. Under no circumstances should you let your dream residence appearance deteriorate. Taking out time to remove dirt from your siding and porch is easy. However, most of the times, we tend to forget to clean our roofs. This results in an untidy appearance that can eventually lead to roof leaks if not maintained. You can protect your investment by properly cleaning the exterior walls and roof of your home. If you intend to keep the hard earned money in your pocket, keeping a clean roof year round can help. Here at R & R Commercial Surface Cleaning we understand the precise requirements and tools needed to remove unwanted substances from your roof. Moreover, the services provided are economical and environmentally friendly; keeping you and your family safe from any potential harm. Algae and mold on your roof are unattractive. However, this should not be your only concern. Roof algae is a living thing that feeds off your shingles. If this issue is not taken care of, you will experience a quick decline of your shingles. Shingles are responsible for blocking UV rays and this deterioration will decrease your home’s energy efficiency leading to a rise in electricity bills. In contrast to the cost incurred for reroofing, residential pressure cleaning services are cheaper. Most roof cleaning contractors charge a fair price which is around $300-600. However, roof replacements costs are much higher. For this reason, you must hire a professional to clean the roof and eliminate all the harmful elements. Houses and commercial buildings in Miami, Florida, mostly have roof tiles, irrespective of type: concrete tiles, terracotta tiles, or clay tiles, asphalt shingles and metal roofing. Cleaning these roofs can be tricky and dangerous. Choosing local roof cleaning companies seems like an obvious choice. 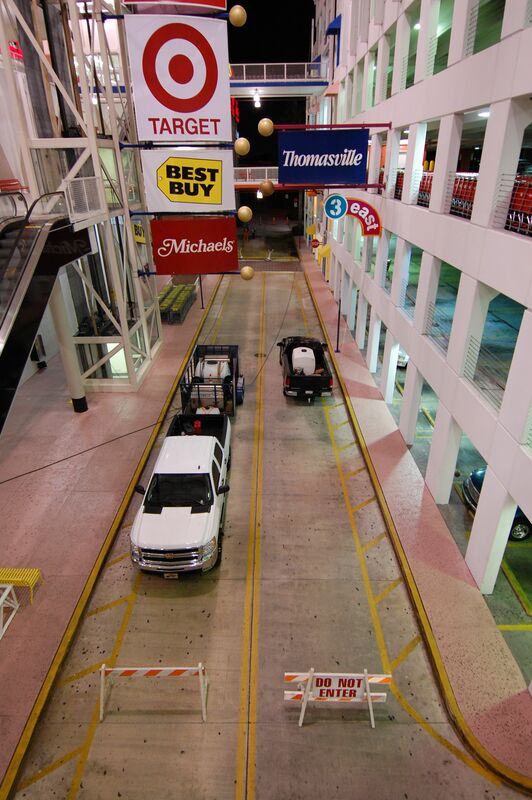 R & R Commercial Surface Cleaning is one of Miami’s popular roof cleaning companies that utilizes eco-friendly methods for commercial and residential roof moss removal. We intend to provide homeowners the desired results by cleaning their roof without any delays and leaving it spotless. Moreover, our prices are extremely competitive. You can extend your property’s life and give it a refreshing look by choosing soft wash roof cleaning. Our soft wash uses chemical compounds that guarantee ‘overall cleaning.’ It also facilitates to take out stubborn spots, most, algae, rust or bird droppings from the roof. We offer comprehensive roof cleaning services in Miami that ultimately refurbishes the original color of your home’s rooftop. Our company is insured for home roof cleaning and exterior house cleaning. A professional team of experts is accessible. We have previously satisfied several high profile customers in the exclusive arena of roof pressure cleaning. Give us a call today and speak with one of our specialists to get a free over the phone estimation.